My bookshelves are full of issue books, and I enjoy digging into a story about characters struggling with serious and complicated situations. They aren't the easiest of books to write (or read), so please help me welcome Aimee Salter to the lecture hall today, to share some of her thoughts on handling these often challenging novels. 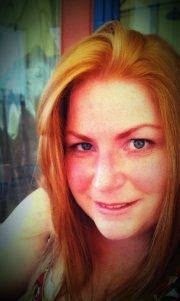 Aimee L. Salter is a wife, mother, and author. She lives in Southern Oregon, where she writes novels for teens and the occasional adult who, like herself, is still in touch with their inner-high schooler. She never stopped appreciating those moments in the dark when you say what you're really thinking. And she'll always ask you about the things you wish she wouldn't. Aimee’s debut novel about a girl who can see and speak to her adult self when she looks in the mirror, was originally self-published as BREAKABLE, but was acquired by Alloy Entertainment in 2014 and re-released as EVERY UGLY WORD. It will be released in paperback on June 16th, 2015. Last year my book EVERY UGLY WORD hit digital shelves. It’s the story of a young woman who can see and talk to her adult self every time she looks in the mirror. Oh, and she’s bullied at school. To me the story was always intended as a commentary on how differently we see ourselves in hindsight. How the blinders of self-loathing, or social criticism can skew our view of ourselves to such a degree that we lose sight of the truth. In my head it was a story about love—love for oneself, and love for another human being. The first time I heard the words “issue book” in relation to my work-in-progress was a traditionally published friend who critiqued a later draft for me. Until that moment it had never occurred to me that my book would be viewed that way. Sure the protagonist was bullied, but that wasn’t the focus of her narration. That was just the conflict she was working through. 1. As an author, the way you see a story, the way you hope to tell it, really has no bearing once it’s in the public arena. Each reader will see the book differently. They will pull from your work whatever is most poignant (or despicable) to them. 2. When you write about an issue that touches a nerve, you need to be prepared to speak to the issue as much as the novel. I’d known going into this that the issue of bullying would be raised. I’d been prepared to share my personal experiences, and my thoughts on bullying in general. But I’d considered it a side-note. One question among many. Instead, most of my public interest came from special interest groups focused on bullying, or bloggers who’d experienced it themselves. Mothers with concern for their children, young people living the nightmare. Of course I wanted to connect with those people. I was happy to let them know I understood where they were coming from. What I wasn’t initially prepared for was the expectation that I speak to the issue as “an expert”—with all the potential pitfalls that entails. Now, anyone who knows me personally will tell you, I speak to pretty much everything as “an expert”—whether it’s the political landscape, or the color of your socks. So communicating with authority really isn’t a stretch for me. But I’ll admit to some discomfort because my history of being bullied, the effects it had on my psyche—while under control now—are still present as a part of me. It’s because I was bullied that I have to consciously control my train of thought. Not allow myself to spiral into the pit of speculation on how much, or in what vein, I am being judged. It’s because I was bullied that I always strongly suspect people are secretly mocking me, or looking to trip me up. The fact that it was the issue of bullying itself that I was expected to speak on—and that I could be judged harshly, with no recourse—created a kind of negative resonance in my heart. Here, world, let me throw myself onto the table, a vulnerable, beating heart in fictional form. Then let me take that very vulnerability and expand upon it in detail. After which I shall wait patiently for your affirmation, or contempt. In short, I freaked out. I spent a month or so after the release in a state of mild panic—what if someone from my past read it and made fun of me? What if someone who knew me in this day and time as a strong person, lost respect for me? What if my friends thought I wasn’t any kind of person to be telling others what to think about this very sensitive issue? What if, what if, what if . . . Welcome to the emotional dissolution of a bullying-victim’s heart. It took several weeks (and a lot of prayer) for me to come to the point where I realized nothing bad was happening. Sure, I’d had some pointed questions. And some criticism. But nothing I couldn’t handle. In fact, the only thing I was really struggling with were my own expectations. My own fears. Because the vast majority of reviews and interviews and features were lauding my efforts. Acknowledging my voice. Encouraging others to pick the book up. The very mindset and history that allowed me to write a story from the heart of a person who is bullied, was working against me as I tried to speak those insights into the world. It wasn’t until I got that anxiety under control, that I could see the ironic nature of what had happened. So, I say this to you, with a nod to the inevitable: When you write from your heart, and your story highlights a problem that will be picked apart by others, you must be prepared for echoes. Echoes of your pain and fear. Echoes of bad habits that have hurt you in the past. Echoes of attitudes or assumptions that undermined your original story. But that’s okay. Because when you write an “issue book”, you aren’t writing for the critics, or the reviewers. You especially aren’t writing for the publicity team; You’re writing for the reader who connects with your character in a way that speaks to their real and actual heart. I was stunned. And touched. And so encouraged. That kind of reaction is the reason I wrote an “issue book” (without meaning to). Because when you bring a piece of real life into a fictional story, you have the ability to touch the real lives of those who read it. So, if you’re writing an issue book, don’t be scared off. There are hurdles to come, and fears to face. But there are also warm moments of connection with complete strangers. And a unity of mind and heart with the people you always hoped to “meet” through your story. When seventeen-year-old Ashley Watson walks through the halls of her high school, bullies taunt and shove her. She can't go a day without fighting with her mother. And no matter how hard she tries, she can't make her best friend, Matt, fall in love with her. But Ashley also has something no one else does: a literal glimpse into the future. When Ashley looks into the mirror, she can see her twenty-three-year-old self. Her older self has been through it all already--she endured the bullying, survived the heartbreak, and heard every ugly word her classmates threw at her. But her older self is also keeping a dark secret: Something terrible is about to happen to Ashley. Something that will change her life forever. Something even her older self is powerless to stop. 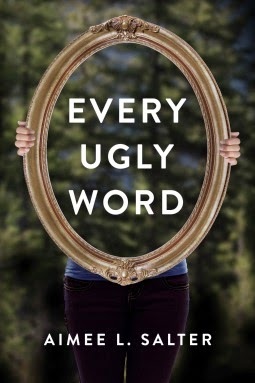 Perfect for fans of Thirteen Reasons Why and The List, Every Ugly Word is a gripping and emotional story about the devastating consequences of bullying. Ha! Yeah, me too. I mean, I would do it over, you know? But it was definitely a process. Thanks for stopping by. Most of us will never experience a reaction like that to our work. You touched lives and made a difference, Aimee. That is awesome. I'm sorry you went through it, but your book is all the stronger for the personal experience and will help (and has helped) others even more. I cannot wait to read this book. You're just writing a book from your heart and it jumps into the world and you're caught in a vortex where you have to become the expert behind your book? The nigtmare! I'm not writing an issue book, ever. Oh, wait! Did you say you didn't intend writing an issue book. Oh, no! That's where your research is of the essence. Thanks for your honesty. It was cool to read this.